This week has brought not only the arrival of spring but also BIG news for us as we have officially announced our second location: the Parched Eagle Taproom that will be located at 1444 E. Washington Avenue on Madison’s near east side! The Taproom will be just that: a bar serving eight of our beers on tap along with four rotating guest beers AND a firkin system featuring (usually) one of our English-style pale ales! We will not be installing a brewing system there. We’ll continue brewing out of our original location while also ramping-up contract brewing with our buddies the House of Brews in order to meet demand for both locations. The Parched Eagle Taproom will look much like the current Parched Eagle Brewpub, with a wooden bar and rustic atmosphere. With 676 square feet, the maximum capacity will be 49 people with seating for 36. We will have neither food or live music at the Taproom but one of our partner businesses in the building–Art In–will continue to be the live music venue there. 1444 E. Wash is shaping up to be a most interesting multi-venue location perhaps reminiscent of the Hotel Washington. 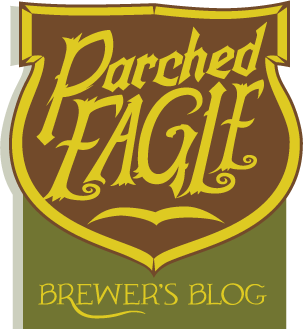 The Parched Eagle Taproom will fulfill the role as craft beer destination there! As this is the Brewer’s Blog I would be remiss in not mentioning a new creation that will be the house beer for the Taproom: BURGEONING GOTH QUEEN Oatmeal Stout! Look for BGQ to be big, rich, bold, and pretty thick and creamy given use of oats. Target ABV is 6.8% and there will be enough IBUs (International Bittering Units) to balance out the sweetness from the oats and malts.